Orfit Colors NS offers beautiful metallic and bright colours. Coloured products are highly recommended if you are looking for new ways to boost your patients’ morale, make them feel good and improve patient compliance. Unique painter’s palette of metallic and bright colours with a nice high gloss and shiny surface finish. Wide range of colours meets every patient’s personal preferences, certainly children and sports athletes. Combined with a lot of other beneficial factors, this will improve patient compliance. Coating allows for temporary bonding during fabrication. Reliable permanent bonding is possible after removing the coating and using dry heat. All attachments and outriggers can be applied with maximum ease. Aesthetically pleasing surface. Prevents the material to stick onto bandages or cotton lining. Prevents cross-contamination between materials in a splinting department and keeps orthoses hygienic for a longer period of time. Orthoses have a longer life cycle. Fracture braces (if applied circumferentially). Small strips can be used as nice and colourful edging strip. 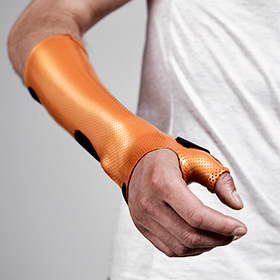 A complete immobilization orthosis for the wrist. Due to its light weight and small size, it is very comfortable, very supportive and also extremely strong and durable. Intended for acute cases. The dorsal part at the level of the thumb prevents hyperextension of the distal phalanx. This part can easily be cut away when necessary.